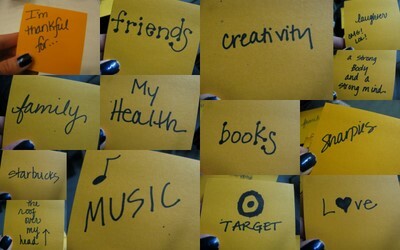 A collage made from the post-its I created for Danielle’s GRATITUDE VIDEO. If I had been thinking, I’d have only used TEN post-its, instead there are thirteen, so… Whoops. I also should have touched up my nail polish. (OPI – Yo Gotta Get This Blue – of course). Also, below is a video made by Amy Krouse Rosenthal (of Beckoning of Lovely fabulousness) – the 22 Things her Children taught her. I kind of like this a lot. Happy Thanksgiving everyone. I hope your day is filled with fabulousness and good food. Sweet video. I really expected to see some kiddy feet jumping into that pool by the end! 🙂 Good lessons. And I love your post-its.